We’ve all heard the word “refinance”, but what typically comes to mind is mortgages. Yes, you are correct. It also can apply to other areas of your finances such as car loans, student loans and credit cards. As with any borrowing, you want to pay off the debt as quickly as possible. But sometime you cannot afford to purchase a car with cash, so you take a car loan. You may want to look into refinancing your car loan if you can get better terms – lower interest rate. For student loans lower interest rate is probably not the answer. You may have several loans and several payments. It might be easier for you to keep track of and have only one payment per month, if you consolidate. Check out your options to determine if this is right for you. Credit cards are a good example. You may be payoff debt and it may seem like it takes forever. It could if you have high interest rates. Refinancing a credit card balance to a lower or zero percent interest rate will help you pay back what you owe quicker and pay less in finance charges. As with any financial transaction, do your research and compare all terms and conditions to see if this is the right move for you and your finances at this point in your life. 1. Payday loans aka payday advances rely on your employment / payroll history. You borrow short term money to be paid back at your next pay date. These are unsecured in the sense that there is no collateral. Depending on how the interest is calculated by individual state regulations (in the states that allow them), your interest rate can be upwards in the hundred percentage range. Not a very cost effective way to borrow money. 2. Balloon loans / mortgages: These types of loans are NOT fully amortized. With most “good” loans you make an agreed upon payment, and at the end of the term the loan is paid in full. But that is not the case with a balloon loan. Your payments are not high enough to pay off the loan at the end of the term. Once you think you are finished, you end up with a very large final payment which may be 50%, 60% or even 100% of your principal (hence the name ‘balloon’). 3. Rent-to-own loans: You make rental / lease payments towards the ownership of an item (furniture, TV, computer, etc.). You can terminate the rental / lease at any point and return the item, though there may be a penalty. Once the agreed upon payments are made, the item is yours. This looks like an affordable way to get what you want right away, but it isn’t. Typically, you pay substantially more for the item than if you just used a credit card. In each of these cases, borrower beware. Read and understand any legal agreements prior to signing. You need to understand what you are getting into and for how long, so that you can make an informed choice that is right for you and your situation. If you don’t understand the contract or feel pressured, that would be your signal to walk away. When you co-sign a friend’s loan, you are taking out a loan. Yes, you read that right! You are agreeing to make the payments if the borrower does not. But, the borrower is your friend and he would never do that to you, right…? A lender only asks for a co-signer if the borrower isn’t creditworthy on his own. The lender could have good reason if your friend has a poor credit history, or doesn’t make enough money for a loan of that size. Or, it could simply be that the lender has no proof that your friend is good with money, because your friend has never taken out a loan or had a credit card before. Because they are unsure about your friend, they’re counting on you to step up and take responsibility if things go badly. Remember, if your friend doesn’t make the payments in a timely manner, or doesn’t make them at all, it will show up on YOUR credit history as well as his, and hurt your credit score. If your friend is too embarrassed, or too disorganized, to tell you that he hasn’t been paying the loan, you might have to make a really big payment to get the loan current again. And by then, the damage to your credit score will already be done. It will take years for the late payment history to drop off your report. I know you want to help your friends, but, think carefully before you make a decision that could change your finances for the worse. It’s that time of year: holiday bills are arriving and you’re not sure you have the money to pay them. If you live on the east coast, you can add in unexpected snow removal costs. Where will you get the extra money? You might think that your tax refund is where you’ll get the money you need. That’s a good thought, but don’t sign up for an instant refund. Some tax preparers or quick cash companies will tempt you with faster returns. They give you part of your tax refund ahead of time as a loan. Don’t do it! This is one of those money drains that isn’t worth the cost. All loans have fees and interest. With quick income tax return loans, the fees and rates can be outrageous. Let’s face it: companies who lend money are in the business of making money. It wouldn’t be worth their time and effort to give you a cheap loan. I strongly urge you to skip the quick cash and speed up the refund process with these three suggestions. If you are expecting a refund, then by all means get your taxes done and filed as soon as possible. The quicker you file, the quicker you get your money back. You can speed up the process by having your tax preparer file your tax returns electronically, which can save you the mail time. Have the refund direct deposited to your bank account and again save the mail time. If you do these three things, you can have your refund back in your hands in weeks. Then you will have the money you need and keep more of it in your pocket. A friend of mine recently asked about lending money to a friend. I have always said that if you can afford to lend money to a friend, then give the money as a gift. If the gift is repaid, that’s an unexpected bonus. But, you should never lend money to friend, especially money that you need to pay your own expenses. I say this because when people lend money to a friend, they often never get the money back, That’s not because your friend isn’t trustworthy, or sincere. It’s a matter of need. Think about it: If your friend can’t afford to pay a bank loan or rent, then how will he be able to pay you? Especially before you need the money yourself? Unfortunately, lending to a friend often means the friendship is lost along with the money. It’s difficult to watch a friend drowning in debt or suffering without a car or apartment, but two drowning people are not better than one. There may be better ways to help out than putting yourself at risk. Back to my friend. Unfortunately, she had already lent a substantial amount of money. She had also done everything possible to set up the loan legally with a contract, lien against the borrower’s home, and a formal payment plan. It sounded OK, so, I asked what the problem was. She said that her friend had filed for bankruptcy. That’s a problem. My friend did everything right and took all the steps to protect herself, and now she will be out a large amount of money that she needs to cover her own expenses. She could never have afforded to give this amount as a gift, but that’s what it became. Will she get her money back? Probably not. In this economy, her friend’s home may not sell and when it does, it probably won’t sell for enough money to cover the loan. My friend learned a very hard lesson in life. Their friendship will probably never be the same because of the damage that was done. 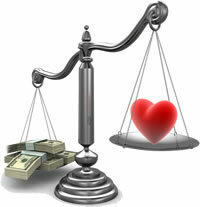 Before you lend money to someone, think about all the possible outcomes and then make your choice. Reader Question: The store is offering a buy now-pay later deal – is there a catch? The only catch is that you might cheat yourself. Many stores offer these deals and they are legitimate. If you pay the loan off on time (and it is a loan) you won’t have to pay interest. If you don’t pay it off on time, you pay interest for the length of the loan – that could be 15% interest for 12 months on a $5,000 purchase. Ouch. Some bargain. The real problem with these deals is that most people don’t pay off the loan on time. The rule is simple: if you can’t afford to save up for a purchase, then you probably can’t afford to make the payments. I am not in favor of this type of offer. I strongly encourage you to start saving and wait before you buy. If you hate your furniture, take some pride in saving for a new set. In fact, brag it up. Saving for purchases is smart. You might find that you can get a deal on much better furniture if you save ahead of time instead of buying the sale items that the store is trying to unload with their “buy now-pay later” deal. However, if this is truly an emergency purchase that can’t wait, like a furnace or hot water heater, then make paying it off a priority, even if it means cutting back. I’ll discuss clever ways to cut expenses in future posts. Have you ever loaned a friend money? If you’re like many people, you found out that he wasn’t planning on paying you back anytime soon. Not before buying himself Guitar Hero, that new graphic novel, and definitely not before his big vacation. But loaning cash isn’t the worst financial mistake you could make. There is one big mistake that I never want you to make: Never co-sign a loan for a friend or relative. Okay, you may think I just don’t care about other people, but I am looking out for you. Who has to make the payments? When you co-sign a loan, you’re telling the bank (Lender) that you are responsible if your friend (the Borrower) doesn’t make his payments. That doesn’t mean they expect you to nag your friend for them until he agrees to pay. It means they expect you to pay the loan off. Anytime he doesn’t pay, you have to pay. What’s the worst that could happen? That would be when your friend doesn’t tell you he’s not making payments. You won’t know the loan is past due until the Lender contacts you, and your credit report is already damaged. You not only have to come up with two or three payments right away, but your other loans (Creditors) may already know that you (not your friend) are late on your obligation to pay off a debt. See, your creditors don’t care about your deal with your friend, they just see your name and a past due loan. That means that all of your creditors could increase your interest rates on totally unrelated accounts. Can they do this? Oh, yes. Your credit card could go from an affordable interest rate of 10% to over 30%, making it nearly impossible to pay off. That’s why you should never co-sign a loan. It’s better to help a friend learn how to fix his credit so he doesn’t need a co-signer than to drown in debt along with him.